When I was a kid, I knew it was spring because I was itching to go to camp. I loved that week of long days outdoors, campfire cooking, sleeping under canvas and returning home tanned and tired. Those days seem such a luxury and so, so far away. I have got to work out how to recreate that feeling. For now, I'll appreciate these little signs of spring, and promise of the coming summer. The lawn needs mowing. For months, nothing, and then bindi-eyes, grass up to your ankles and weeds, so many weeds. Everything in my garden is bolting to seed. Spring storms. We've had a few rumble through already. Salads and barbecued snags are appearing on the menu. They'll be in high rotation soon. The alarm goes off at 5am, but my daylight saving-denial is real and the body says it's 4am. It's too warm to wear a jacket on the way to work, but still cool enough at night to want Uggs. Early season mangoes. Mmmmm. Mangoes. The jasmine, olive tree and hippeastrums are about to flower. 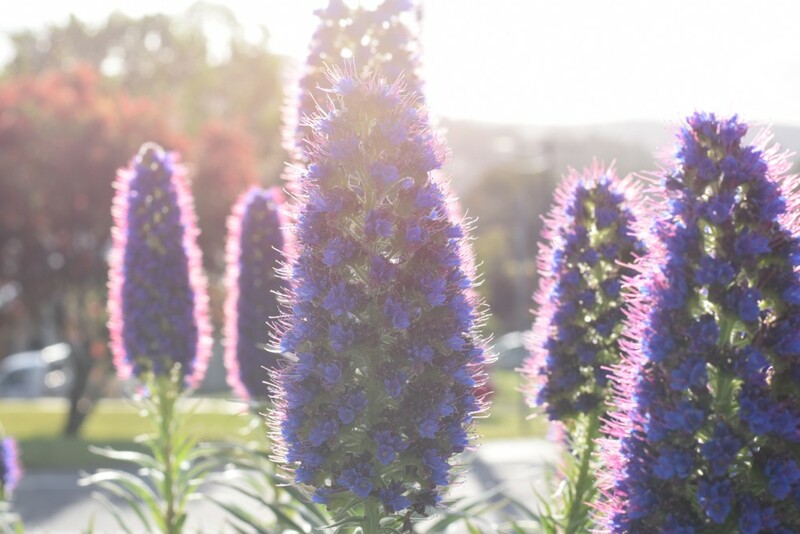 The echiums, pictured, have been flowering for weeks. I am getting invitations to end-of-year celebrations. All the fashion magazines have swimwear spreads. You start the morning walk in track pants but change into shorts as soon as you arrive home. There are more people out walking in the morning (must have seen those swimwear spreads). It's still daylight when the evening news is on. You're thinking about the summer season and plans for Christmas. Such a beautiful springy/summery photo Kate. I have hippeastrums flowering too and they are so beautiful, I am wishing I had more of them. We were just talking about Christmas ourselves and our lack of planning...how can it possibly be that time of the year again?